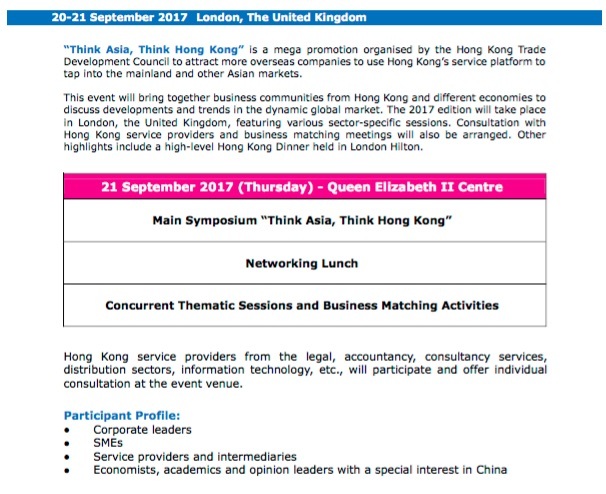 We are delighted to invite CAFE members to the “Think Asia, Think HK” symposium on Thursday, 21stSeptember in London. This event is organized by the HK Trade Development Council and CAFE is honored to be invited as a supporting organization for this flagship event to promote HK as a platform to access the opportunities in Asia, particularly the Chinese mainland. This event will bring together over 1,000 British and Hong Kong business delegates to discuss developments and trends in the dynamic global market. You will be able to hear from distinguished speakers from Hong Kong and the United Kingdom in the event. Speakers include Mrs Carrie Lam, the newly appointed Chief Executive of Hong Kong Special Administrative Region of PRC and Dr Liam Fox, Secretary of State for International Trade in the UK and many more. Consultations with Hong Kong service providers and business-matching meetings can be arranged as well.